Question of the WeekI heard a lot about open-source software. What is it? Let’s start with “closed-source software”, which is a fancy name for most proprietary software that you buy (or supposed to buy). This kind of software comes with a user license that does not allow you to modify the software or to share it with others. Once you purchase the software, you are allowed to use it, but not much else. An example of closed-source software is the popular Microsoft Office suite, which includes Word and Excel. You can use Microsoft Office to edit documents, but you are not allowed to distribute copies of Microsoft Office to friends, and you are not allowed to modify the software. Even if you decided to violate the license and to tweak the software, you would find it to be extremely difficult: the original human-readable code of the program, known as the source code, and written by engineers at Microsoft, is kept secret (or “closed”); the software that you buy is only a translation of that source code into a cryptic sequence of computer instructions that is very difficult for humans to modify. In the late 1970s and early 80s, a movement started to promote the use of open-source software, where the source code of the software is “open”, and thus freely available for anyone to copy, use, redistribute, and modify. The open-source movement has gained incredible success, and created a dazzling array of high-quality software offerings. Many of these open-source software projects are community efforts run by thousands of volunteer programmers who contribute their time and knowledge to the success of the product. Linux, a popular operating system, is one example of open source software. Another is the Android operating system used in many of today’s smartphones (in contrast, Apple’s iOS operating system is proprietary closed-source software). The open source philosophy has propagated into other domains, such as education, robotics, science, and media. 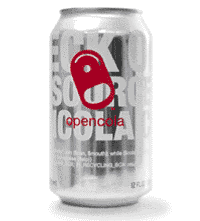 And if you are into beverages, you can even find an open-source cola recipe!